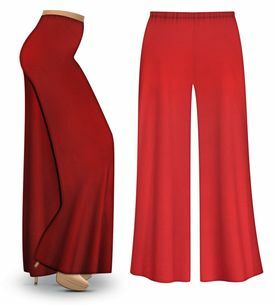 These are fabulous wide leg stretchy palazzo pants in roomy plus & super sizes in slinky, velvet or poly/cotton jersey fabric. They have a high rise, an elastic waist and extra roomy hips & thighs! Patterns and colors are only approximate and will vary from piece to piece due to item size, computer monitor & dye lots. To ensure a proper fit, please take your measurements & compare them to the size chart listed below. Measure around the largest part of your hips. For length, measure from the inseam down.